New debut 2013 SL and SLK Class Mercedes at the Beijing Auto Show has a Magic Sky technology to the moon roof similar to the window tinting technology found on the Boeing Dreamliner 787. Crystal polymer sandwiched between glass is opaque when there is no electrical charge, and becomes clear when small electrical charge is applied at a touch of a button. No word on whether the Magic Sky technology offered by Mercedes has incremental levels of tinting control offered by the Boing 787 aircraft. Incremental control allows for shades of tint rather than a strictly boolean on or off setting. Company officials cautioned, however, that the technology won’t be on the market anytime soon. In addition to the engineering necessary to adapt the technology to a window that rolls up and down, must fit into a door, and must be safe during a crash, there are also considerable legal hurdles to be cleared. 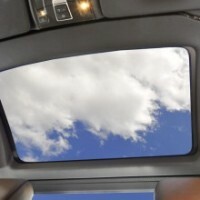 Laws on window tinting vary by state and country, which could make it too expensive or difficult to certify the technology with all the various regulatory agencies around the world. The automaker did not give a timeline for real-world applications. If and when it does come to market, we expect it will debut in the company’s more expensive models first and trickle down as costs are amortized.